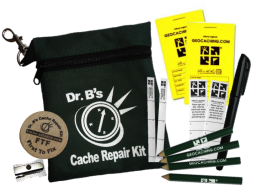 We’ve redesigned Dr. B’s Cache Repair Kit! 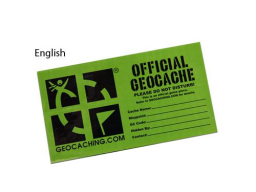 Geocaching has changed over the years since we first introduced Dr. B’s Cache Repair Kit in 2005. Back then, cache containers were usually larger and often had more ‘parts’ to them. These were prone to mishaps and getting damaged. Nowadays, most field repairs consist of simply replacing the log (book or log sheets) in a smaller or micro sized container. 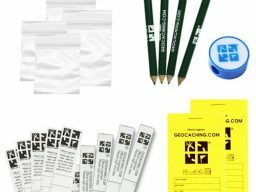 So we redesigned our Repair Kit to reflect what you’ll need to make cache repairs today. 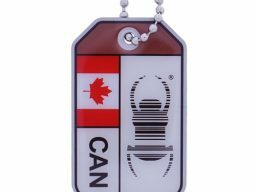 Kit is very ‘stuffable’ and compact: measuring only about 6″ x 7″, and weighing in just a few ounces.